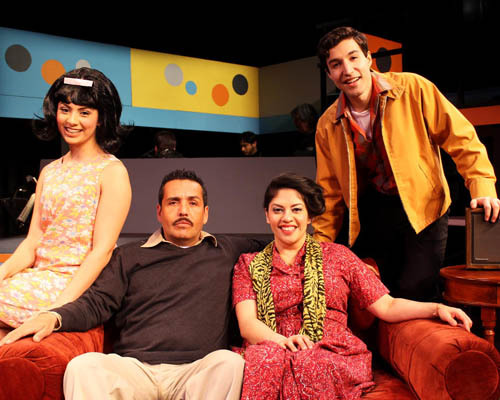 From left to right: Angel Marie Galván, Gabriel González, Diana Castrillón, and Kenneth López as the Ramírez family in Eastside Heartbeats at Casa 0101. What if it was 1965 and your East LA rock ‘n’ roll band, inspired by Ritchie Valens as well as the runaway success of ’50s and ’60s Motown rhythm & blues, was about to break out in a big way? What if, for one glittering moment, your memory could zoom in on the still photo of your group racing across the tarmac at LAX to board a flight with the Fab Four, yes, those blokes from Liverpool, headed for New York City after a jaw-dropping, show-stopping gig at the Hollywood Bowl as an opening act for The Beatles themselves? Would you pinch yourself? Would you die and head straight to heaven, the dream of a lifetime made real? What if this really happened? Well, it did. And it was high time someone did something to remind the rest of America that “once upon a time,” doesn’t always mean make believe. Loosely based on the story of Cannibal & the Headhunters, a band that shot straight out of the Ramona Gardens housing projects in the Hazard community of Boyle Heights to chart-topping success and an opening slot for The Beatles at Shea Stadium in the Big Apple, Eastside Heartbeats is a heart-warming love letter to a forgotten era in LA musical history. It was an era, suggests the new musical currently in production at Casa 0101, that witnessed a bonafide, never- before-seen and unparalleled East LA rock & roll explosion. Written by music scholar and historian Tom Waldman and directed—as well as choreographed—by Corky Domínguez, Eastside Heartbeats: A New Rock ‘N’ Roll Musical features music and lyrics by James Holvay, with additional music and lyrics by David Reyes, Tierra stalwart Rudy Salas and Waldman himself. Set in the middle of the '60s, a year that would be punctuated by riots in South L.A., the direct deployment of U.S. combat units in Vietnam and the second time in a row that The Beatles would storm the Hollywood Bowl as the world’s biggest rock and roll band of the day. A two-act production that rolls—and rocks—along at a vibrant, engaging clip, the musical follows Jimmy Ramírez, lead singer of the band for which the show is eponymously named. Ramirez and his family take center stage in the ultimately feel good drama that draws the greater part of its magic from the contagious music, wall-to-wall dancing and homespun humor that thread the universal story together effectively and efficiently. Much like Cannibal & the Headhunters, the real life band that achieved brief national prominence with a song called "Land of a Thousand Dances," the Heartbeats embody all the hopes and dreams of a generation that represents the possibility of integration and tolerance. Accordingly, the Heartbeats become the embodiment of a blended, multi-hued, distinctly American future where African American and Chicano rockers are honored and respected for their contributions to the musical landscape. In Waldman’s timeless, Cinderella-esque tale of long-shot underdogs, the Heartbeats crash tragically into the racism that obligated artists like Ritchie Valens and Vicki Carr to change their names in order to realize the mainstream success and popularity merited by their talents. To make matters worse, Jimmy Ramirez—as the heart and soul of a band poised for superstardom—must also contend with the generational conflict that pits him against an embittered, working-class father who makes no secret of his disapproval. In the role of Jimmy, Kenneth López faces off against his immigrant father Carlos, portrayed with pitch perfect emotion, vocal prowess and undeniably authentic pathos by veteran songster, bandleader and actor Gabriel González. Their interaction and the visceral chemistry between them imbues the production with its most dynamic, gut-wrenching and believable relationship. The songs are all extensions of the story and sparkle with magnetic energy. A tender song that eulogizes Valens and bonds a brother and sister through music is called, appropriately, “A Special Place.” The sweetness of the latter is countered by “I Had My Say,” the song that speaks to the unbridgeable rift between Jimmy and his father. A song that is an accidental hit in producer Hal Fish’s recording studio, “Watcha Doin’ Tonight,” becomes both the band’s bane (when it won’t get added at East Coast stations because the band is Mexican) and its salvation when The Beatles come calling. A joyous celebration of an undeniably special period in Southern California rock lore, the play becomes, itself, an anthem for a generation. While the production suffers slightly from a pair of less than stellar casting choices—misfires which occasion somewhat uneven delivery during critical scenes—the individual vocal performances offset those minute stutters with aplomb. Newcomer Bernardita Nassar as Teresa Gómez is a case in point. She, much like most every other member of the cast, interprets the original musical material with a voice that oozes power and beauty. Unfortunately, her spoken exchanges during pivotal moments provide the few dissonant notes along the way. López, alongside his bandmates, among them Marco Infante as “Mario,” Jesse Maldonado Salgado as “Andy” and Matthew Ramos as “Ronnie,” is as compelling, accessible and honest when he sings as he is when he speaks. Together, the foursome’s vocal harmonies and natural camaraderie evoke the best kind of naíve optimism, brotherhood and fraternal love even as their dreams drift further and further out of reach. The choreography is sensible and fluid without the exaggerated athleticism of traditional rock musicals. Reminiscent of amiable early American Bandstand dancing, it amplifies the dulcet quality of the production. The tandem dance routines seem lifted directly from the period during which the play takes place, adding to a more authentic experience. The sole psychedelic overture in a collection which is primarily a tribute to the ubiquitous three-chord R&B and rock standards which dominated the charts before the British invasion, the song adds little to a production that, with just minor adjustments and polish could play just as easily in Buffalo, NY as it does in Boyle Heights. In theater-speak, it is safe to say that Eastside Heartbeats has legs, meaning that a tour outside of LA’s Eastside is not out of the question. Up for two more weeks at Casa 0101 in Boyle Heights, Eastside Heartbeats: A New Rock ‘N’ Roll Musical benefits from an all-star crew that includes Vocal Director Melodee Fernández, Scenic Designer Cesar Holguín, Lighting Designer José Lopez, Costume Designer Dori Quan, Sound Designer Ivan Robles and Projection Designer Rafael Cárdenas, a photographer whose roots in and familiarity with LA’s Eastside are already the stuff of legend. A companion exhibition, titled “Roots of the Eastside Sound 1955 – 1965” and featuring photos as well as memorabilia and archival materials from the collection of David Reyes is also on display on the walls of the Casa 0101 foyer area which comprises The Jean Deleage Gallery space. Both the exhibition and the Brown Fist Productions musical play continues for two more weekends on Fridays, Saturdays and Sundays through February 14th at Casa 0101, 2102 E 1st St, Los Angeles, CA 90033. For ticket info and/or reservations, call (323) 263-7684.